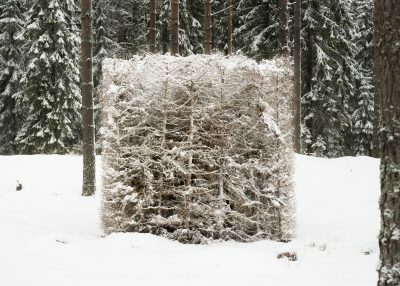 Opening at Galerie Anhava on 4 May, Antti Laitinen’s (born 1975 in Raahe) exhibition Marionette is a continuation of his work on forest themes. The exhibition features video pieces, photographs, reliefs, sculpture and an installation in the basement of the gallery. 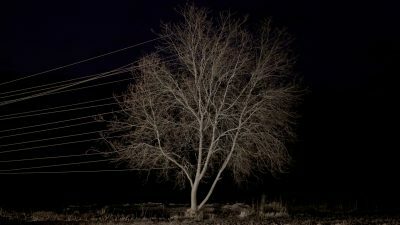 In the video piece entitled Marionette, the viewer confronts a leafless bird cherry tree on the edge of a field, with strings tied to its branches. The strings extend to the left edge of the image, where someone or something that is cropped out of the picture is drawing on them to make the branches move. The tree, lit in the dark evening, moves back and forth as if giving a small performance to the viewer. 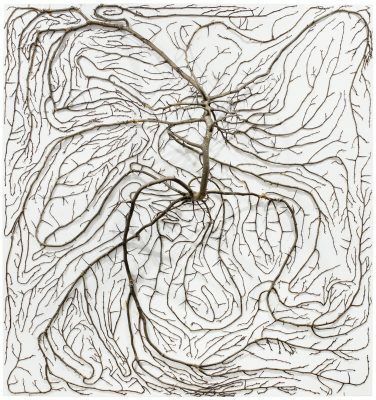 This work combines many things typical of Laitinen’s art: a process involving a great deal of work combined with an act of seemingly light character, performativity, a sincere and playful way of portraying the relationship of man and nature, and an engaging, direct and visually captivating manner of depiction. 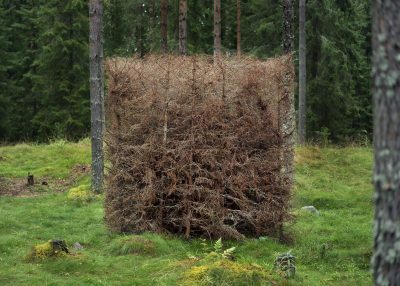 In Broken Landscape, a photographic work, Laitinen has removed isolated parts from a tree trunk. 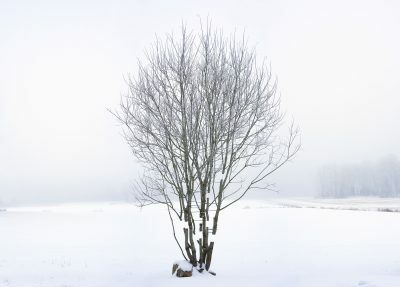 The gaps among the branches are unnatural, with the tree appearing to hover in assembled form in a white winter landscape. The viewer’s eye soon finds the metal frames constructed between the branches to maintain the shape of the tree. 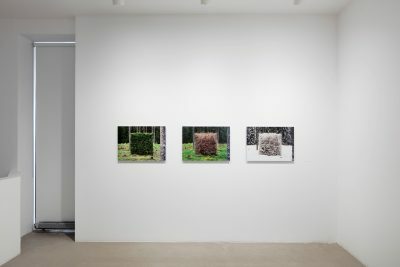 In keeping with the title of the work, Laitinen is interested in making landscape images, ‘to be broken a little bit’. 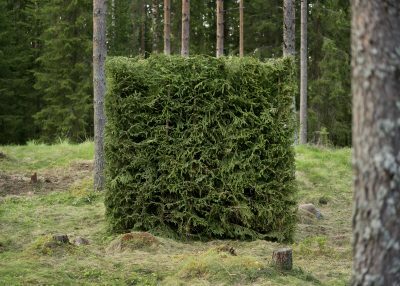 In a series of three photographs, Laitinen made a cube in a forest from spruce felled for thinning, photographing it in spring, autumn and winter. Photographed directly en face, the cube constitutes a prominent element of form in the image. The disciplined cube remains unchanged from one photograph to another, although the branches inside it turn yellow and decay, and snow falls on the ground. 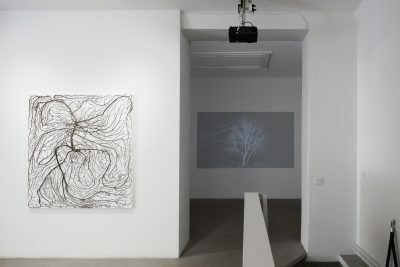 In the wooden reliefs of the 2D Trees series, Laitinen nailed and stapled willows and hawthorn bushes from his own yard on plywood sheeting with a white ground. 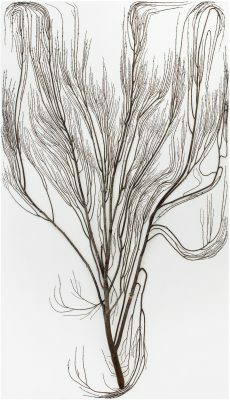 The supple branches fill the rectangular form completely, with only the stumps of the trunks emerging from the surface. He continues to address visual and spatial questions in the installation constructed in the basement space. In Grid Garden, Laitinen plays with the elements of two and three-dimensionality. 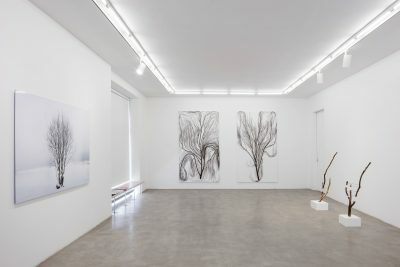 Lilac branches cleared from the artist’s own yard are curved and attached to metal netting painted black, forced on a two-dimensional surface. 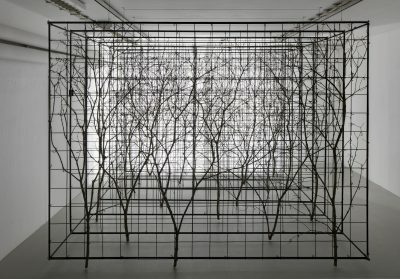 The sheets of branches extending from the floor to the ceiling overlap, forming a multi-layered, silhouette-like thicket of branches and netting in the space. The viewer has access deeper into the space along one side of the room, moving past layers of images. Antti Laitinen graduated from the Academy of Fine Arts in Helsinki in 2004. 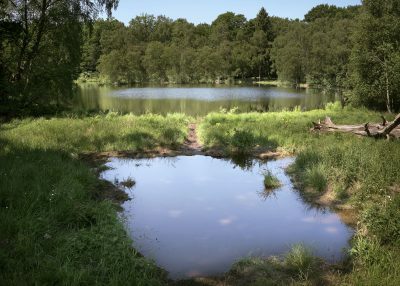 In recent years, he has held solo exhibitions at, among other venues: the Günther Grass Gallery in Gdansk, Poland (2016); Galleri Image in Aarhus, Denmark (2014) and Galleri Andersson Sandström in Stockholm (2013). He has participated in several important international group exhibitions at The Art Gallery of Alberta, Canada (2017); Utopia/Heterotopia in Wuchen, China (2016); Istanbul Modern, Istanbul (2015); MAC/VAL, Val-de-Marne, France (2015) and Treasure of Lima: A Buried Exhibition at the Thyssen-Bornemisza Art Contemporary Academy, Vienna (2014), among others. In 2013, Antti Laitinen and Terike Haapoja represented Finland at the Venice Biennale. 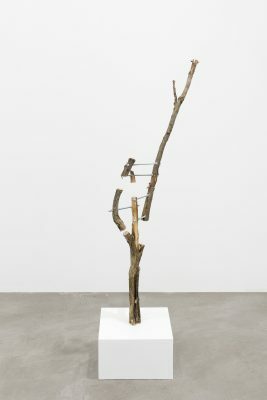 His works are included in Finnish and international collections, including the Saatchi Collection in London, the Saastamoinen Foundation Collection, ArtCenter/Istanbul, HAM – Helsinki Art Museum, the Kiasma Museum of Contemporary Art, the Wäinö Aaltonen Museum/Turku Art Museum and the Zabludowicz Collection in London.